TriMet and GlobeSherpa will be winding down the beta test of the TriMet Tickets mobile ticketing app to prepare for the full launch of the app in August. The last day of the beta test, which started on May 16, will be July 7. After that, final adjustments will be made so we can get the free ticket app in the hands – or smartphones – of all our riders as soon as possible. The highly anticipated app makes buying and using fares convenient and easy. You simply download the free app, enter your credit or debit card information into the secure system and then buy and use the fares with just a few taps of the screen. So far during the beta test, more than 1,600 tickets have been purchased and the feedback has been overwhelmingly positive. We want to get the app to everyone as soon as possible but GlobeSherpa and our team need some time to make modifications and adjustments to make the app even better. Some of those are already in process including clearer messaging on app notifications, but other suggestions need some downtime after the beta test to implement. In addition to buying and using fares, the mobile app provides easy access to TriMet’s online trip planning tool, TransitTracker, maps and schedules. And, it has a cool TriMet logo safety light to help alert bus operators at night. 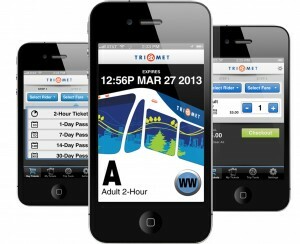 The TriMet Tickets mobile ticketing app is a big step toward a state-of-the-art electronic fare system that we hope to begin implementing in 2015. The mobile app is expected to save the agency money by reducing the operating cost associated with printed and cash fares. Paper and cash fares will still be available via our traditional channels for those without access to this mobile application.